Four different players recorded goals as the Portland Thorns defeated the Utah Royals in a Friday night matchup. SCORE: 1-0, min. 2, Heath. 2-0, min. 32, Horan. 3-0, min. 34, Crnogorčević. 4-0, min. 62, Lussi. 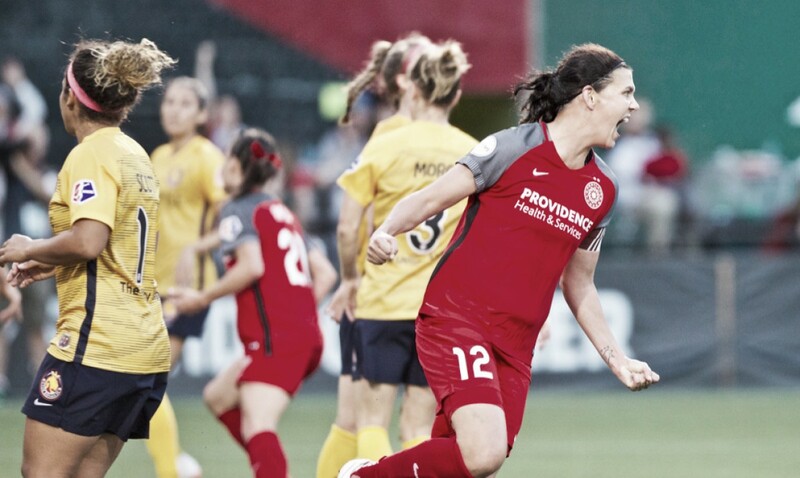 The Portland Thorns rebounded from a crushing Saturday defeat with an emphatic 4-0 win against the Utah Royals. This marked the final matchup between the reigning NWSL champions and the leagues newest team. 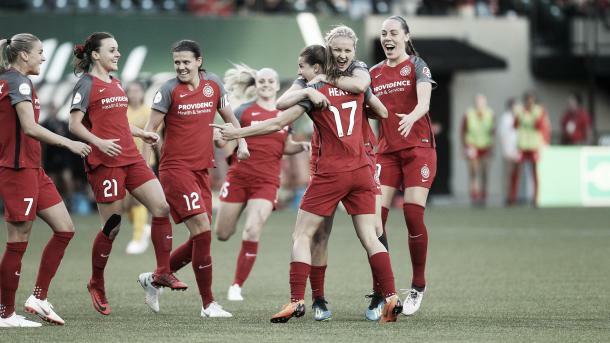 Portland had four different goal scorers in Tobin Heath, Lindsey Horan and Ana Crnogorčević all scored in the first half while Tyler Lussi added the fourth goal shortly after entering the match in the second half. It wasn’t all good news for Portland as Midge Purce exited the match shortly before the end of the first half with an injury. She made her first start since returning from an ankle injury, but a tackle from Utah midfielder Diana Matheson took her out of the game. The match wasn’t scoreless for long as Heath made it 1-0 61 seconds into the game. Heath dribbled into the box and passed it to Crnogorčević who passed it back to Heath. Heath bent the ball under the crossbar and out of the reach of Utah goalkeeper Abby Smith. The goal is Heath’s third goal in 10 games played this season. Horan doubled the lead in the 32nd minute off of a Heath assist, her third assist of the season. Purce was fouled by Royals defender Sam Johnson, setting up a free kick. Heath lofted the ball into the box to Horan who headed it past Smith and into the back of the net. The goal is Horan’s seventh of the season, moving her into first for most-goals. She is now tied with teammate Christine Sinclair and North Carolina Courage forward Crystal Dunn for goals scored this season. Two minutes later, Crnogorčević added her third goal of the season. Horan stole the ball in her half and had her pass deflected to Crnogorčević who bent it on the ground out of the reach of Smith, giving the Thorns the 3-0 lead going into halftime. Utah had its best chance to get on the score sheet in the 56thminute. Christen Press passed the ball to Katrina Gorry who dribbled in front of the box and took a shot from outside. Thorns keeper Adrianna Franch snatched the ball to make one of three saves on the night to keep the clean sheet intact. Portland’s dagger was in the 62nd minute courtesy of Lussi. The forward entered the match for Heath and 30 seconds later scored her first goal of the season. Horan slipped Lussi a through ball where she took a one-touch shot and sent it past Smith to secure the 4-0 win. Utah has two games this upcoming week. They will stay in the Pacific Northwest to take on the Seattle Reign on Wednesday July 11. Kickoff for that match is scheduled for 7:30 p.m. PT. The Royals will then return home to host the Orlando Pride on Saturday July 14 at 5:00 p.m. MT. The first match will be streamed on go90 while the second will be aired on ESPNNews. Portland’s next game is Sunday July 15 when they host the Houston Dash. Kickoff is scheduled for 8:00 p.m. PT and will be streamed on go90.